Dividing assets in a divorce in Dallas? Avoid financial disaster! There were more than 171,000 marriages in the Texas in 2010, according to the state Department of Health Services report of 2014. The number of divorces in 2010 in the State of Texas was more than 82,000. With those odds, could a divorce be in your future? What are key concerns regarding dividing assets in a divorce? • Identify property held both jointly and separately by the couple. • Identify the potential earnings of the different types of assets under consideration. • Weigh the short- and long-term taxable financial consequences of each type of property. • There may be many stipulations in an agreement which are in your interest to strictly comply with after the division of assets occurs. It is important to remember that when going through a divorce, retirement and investment assets are on the bargaining table. Make a list of all the assets that you own, both jointly and separately. This will include bank accounts, checking, retirement and brokerage accounts, stocks and bonds, real estate properties in the Dallas-Ft. Worth area, employment benefits, insurance policies and other properties. Keep in mind that property or assets you may have accumulated when you were not married may be considered joint property after the marriage or after changes to key documents such as deeds. You may also want to consider which properties can wholly be transferred over to one party. This may also make dividing assets a bit easier. Before signing any divorce agreement involving division of property, a financial advisor specializing in divorce should be consulted. Oftentimes, there are many financial decisions to be made with serious tax consequences. Consulting with both an attorney and a financial advisor may be beneficial when weighing your long-term financial security. Retirement accounts can be a substantial source of future income for you after your divorce is finalized. While you may walk away from the divorce with all your current retirement accounts intact, including your 401(k) and IRAs, you may qualify for some assets from your spouse’s retirement funds. There may be tax consequences to you, so speak to a Dallas divorce attorney concerning the transfer of those assets to your accounts. Your divorce has been finalized. Now what? You and your divorce attorney should be able to ensure that every stipulation of your divorce agreement is monitored and accomplished. 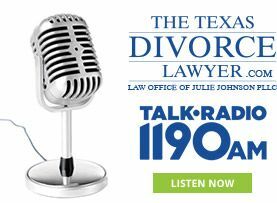 If you have any questions regarding the division of your assets or investments during a divorce, contact Julie Johnson, Dallas divorce attorney, at 214-265-7630. You can also fill out our online contact form. Thanks for all your insight. Can we discuss what happens when children’s interest are involved and one parent refuses to contribute? For instance, no child support requested but responsibilities of life such as braces, car, college?